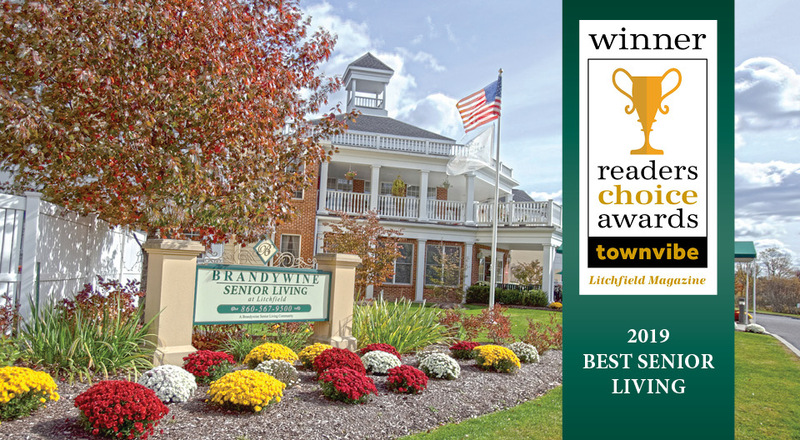 Brandywine Living at Litchfield is proud to be awarded the 2019 Reader’s Choice Award by Town Vibe Magazine in the category of Senior Living. TownVibe Magazine, founded in 2002, is a leading publisher of six award-winning high-quality lifestyle magazines and websites. The Reader’s Choice Award highlights the best businesses in Litchfield, Connecticut, chosen by dedicated readers. Over a thousand TownVibe readers participated in the 2019 survey that included over a hundred voting categories. Brandywine Living at Litchfield offers luxury senior living and memory care services in the historic New England town of Litchfield. Residents can be found enjoying Center Stage Entertainment, Men’s Club, and Card Sharks in the Club Room or classic movies in the theatre. The community also features an abundance of fun and exciting choices with Escapades…for Life! programming and all day dining. All this while loved ones have peace of mind with licensed nurses on-site 24/7. For more information on Brandywine Living at Litchfield, call 860-567-9500 or visit online at www.brandycare.com.